More businesses are purchasing mass-shooting insurance, according to a published report, responding to what is increasingly seen as a potential risk. The article, in Crain’s Chicago Business, indicated that the FBI reports that more mass shootings occur at businesses than any other setting. "It's like shark bite insurance," Peter Kochenburger, an insurance professor at the University of Connecticut School of Law, told Crain’s. "You're selling a product based on exaggerated perception of risk." FBI data shows that 42 percent of the 250 mass shootings between 2000 and 2017 occurred in businesses, more than any other type of location. The next-largest category, schools and universities, saw 21 percent of the shootings, Crain’s reported. The 105 workplace shootings affected barely a fraction of the nearly 6 million firms counted in the 2016 U.S. census, Crane’s reported, with data indicating that 26 percent took place in settings open to the public, 12 percent in settings closed to the public and 4 percent in malls. 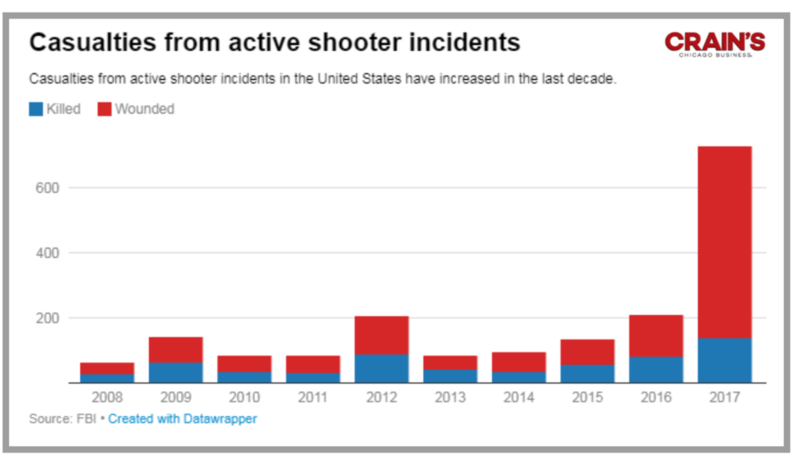 Crain’s reported that insurance companies including Lloyd's of London, American Insurance Group, Hiscox and Beazley started offering "active shooter" or "active assailant" policies within the last five years. They generally cover liability, business interruption and property damage not covered by other policies, as well as expenses like counseling, public relations and funerals. Connecticut has tragically been represented in the two largest categories, businesses and schools. The 2012 Sandy Hook School killing remain seared in the state’s collective memory. That horrific event was preceded by workplace shootings including at the State Lottery headquarters in 1998, in which a gunman killed four, and the Hartford Distributors shooting in Manchester in 2010, when eight people were killed by a co-worker. It has been described as among the five most deadly workplace shootings in U.S. history. In February, a gunman opened fire at an Illinois manufacturing warehouse where he had just been fired from his job, killing five fellow workers.